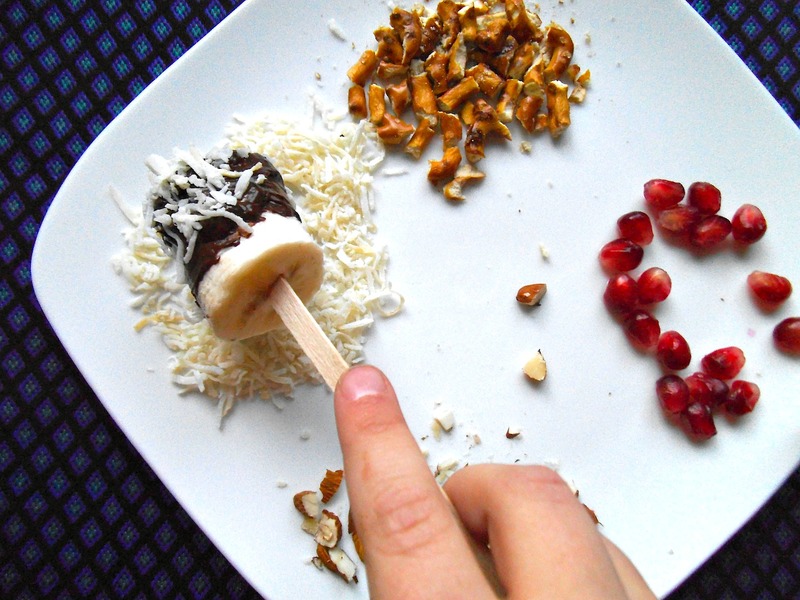 When I saw this super idea at Hidden Ponies to make marshmallows pops with melted chocolate and assorted toppings, I knew we had to try it with bananas. Because I’m just not that into corn syrup. As much as we like sprinkles, to avoid artificial colours this time, I rummaged through my cupboards and the refrigerator and found a healthier array of coatings–pretzels, pomegranate fruit, almonds, and shredded coconut. That’s not to say we wouldn’t use sprinkles (or even marshmallows) in the future though. Yes, I’m ambivalent like that–a sorta health nut mom who tries to move in better directions. Sometimes, but not always. Melting chocolate in the microwave is often a dicey endeavour, but it started well. After rewarming though, the chocolate was getting close to seizing and was none too smooth. A fondue pot, double boiler or water bath is what I am recommending instead. I’ll do that next time. And there will be a next time soon! My daughter and I made and decorated our bananas as an after school snack. Freezing any leftovers is highly recommended. 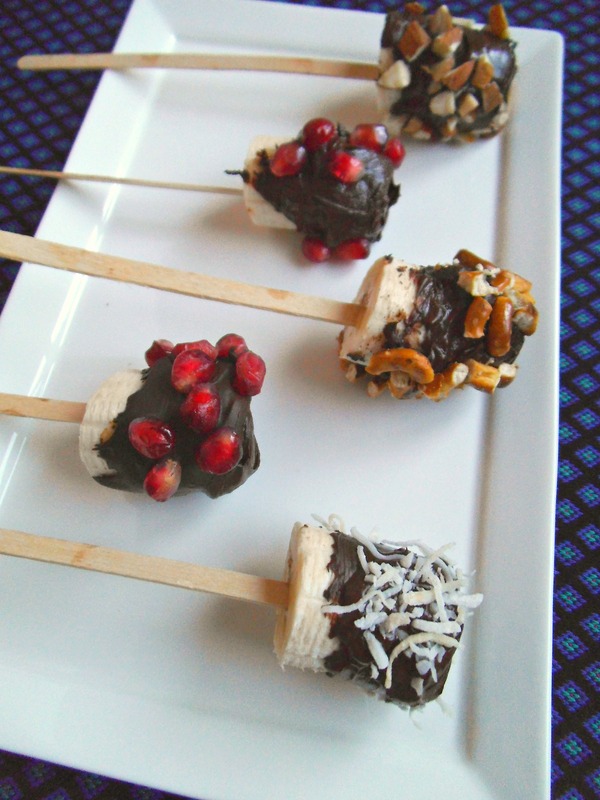 Frozen chocolate dipped bananas are one of my favourite healthy treats. If you can hold back eating them right away, a greater reward awaits. Two hours later (or after supper), cold melt-in-the-mouth chocolate bliss was mine. It can be yours too. Peel and cut bananas into marshmallow-sized chunks. Spear each piece with a wooden stick. Gently melt chocolate using a double boiler, water bath, or fondue pot. 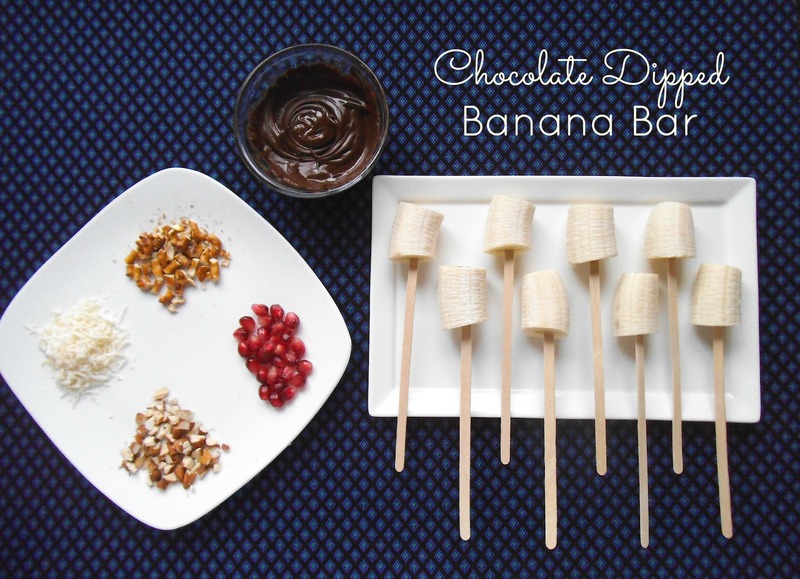 Dip each banana piece in melted chocolate until covered. Roll in desired toppings. Let chocolate harden by resting each dipped banana on waxed paper or by securing end of sticks in slits cut into a cardboard box. Enjoy the dipped bananas at room temperature, or wrap loosely and chill in the freezer until cold (about 2 hours). This is also part of Allergy Free Wednesdays and Gluten Free Wednesdays this week. Thanks for your wonderful inspiration to do this! I love the idea of different toppings for the bananas!